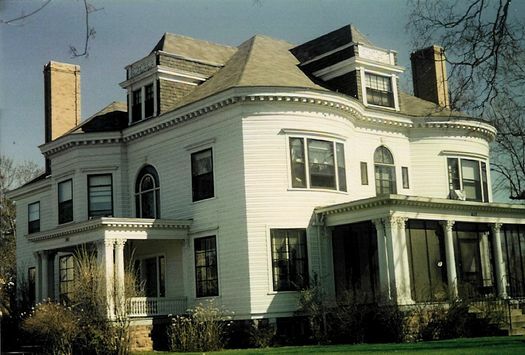 The Colonial Revival design of this house features massive, projecting curved bays and a Georgian cornice. 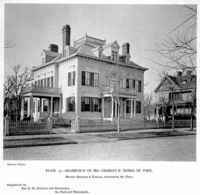 There is a precedent for double, curved facades in Colonial American architecture. For example, the front of the Capitol Building in Colonial Williamsburg has double curved facades. However, the absence of corner pilasters and the large projection of the bays is unusual, although it allows for the maximum visual impact of the bays. Gilbert's original design for the Noyes House in Saint Paul (1887) included large curved walls but retained the corner pilasters. Additional experimental features include alternating-width siding (a detail later common to Craftsman style) and hip-roofed dormers whose roofs terminate in false balconies. Corinthian capitals add sophistication and formality to the porches. The large exterior chimney on the south side of the house is an atypical feature. Simple but varied high-quality wood finishes are found throughout the interior. Leaded-glass windows are similar to those in the Noyes House. Charles Ingram, an executive in the Empire Lumber Company, was a member of the committee planning the Wisconsin State Capitol. The house is located within the Randall Park Historic District, a local and National Register historic district.